Haredim want to work? There’s a revolution of increased Haredi employment? 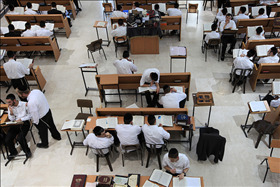 Yeshiva studies improve the mind so well that graduates can learn any subject easily? Let’s not get carried away. ​ How is it that the left-wing and center opposition factions hardly deal with issues of state and religion? Is the opposition again deluding itself that the ultra-Orthodox parties will reward it by forming a government with it? A simple analysis shows that the only significant change between the current government and the next one will be a replacement of the center-right government by a government comprising the right and the ultra-Orthodox parties. The centrist Yesh Atid party, led by former Finance Minister Yair Lapid, and the small HaTenua party led by former Justice Minister Tzipi Livni, will be replaced by the United Torah Judaism party and Shas. Hiddush Vice President Shahar Ilan discusses a leading haredi rabbinic figure's disrespectful comments during Operation Protective Edge. Will the Equality in Sharing the Burden Law achieve the goal stated by its very name? Hiddush VP Shahar Ilan discusses the development of one Israel's hottest political issues and the need for smart solutions in enforcing the law. The wait to litigate on the petitions to throw out the Tal law has lasted a year and a half. The future of the Israeli economy depends on having Haredim go out to work, and Israel must not bury this future in poverty traps in the Galilee and the Negev. Soldiers patrolling through the streets of Mea She'arim during Passover week found themselves in a situation they generally encounter only on the Palestinian side of the border.